Sir John Franklin School was designed by local architect J. N. Semmens and built in 1921 by day labourers under the supervision of the Sutherland Construction Company, along Grosvenor Avenue, between Beaverbrook and Lanark streets. Total construction cost was $52,000. Opened it the fall of 1921, in October the school was named in commemoration of Arctic explorer John Franklin. Prior to its construction, students attended Julia Clark School on the grounds of the Children’s Home. When completed, student enrollment at the one-storey, five-classroom structure increased through the 1920s and 1930s, necessitating additions in 1934 and 1951. By June 1987, however, enrollment had dwindled sufficiently that the school was closed by the Winnipeg School Board. The building was demolished in late Fall of 1991 and its former site has been maintained as a community green space. “Objection to calling school after soldier [Other schools named; Sir John Franklin],” Manitoba Free Press, 12 October 1921, page 2. “Santa Claus finds 3,000 more children attending city schools,” Winnipeg Tribune, 26 December 1921, page 2. “Winnipeg schools, No. 44—Sir John Franklin,” Manitoba Free Press, 6 December 1922, page 4. 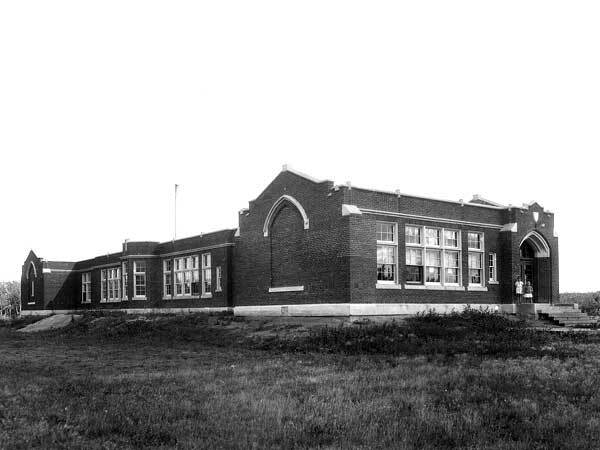 Sir John Franklin School, Winnipeg School Division History Files.